I've been trying to see the bright side of things. Really I have. A few days ago, this article came out on the CBC. I was keen to post about it, but on Wednesday night, the stomach bug disaster struck. I was barely over that first cold when a 'healthy' twin (the first twin to catch the cold), was absolutely laid low by a second virus. The poor kid was up all night, and so was I. Roughly 4-5 loads of laundry later, we lay in a sodden mess on separate couches...and there we stayed Thursday, Friday, and Saturday. By Sunday, the kid was well enough to go to dance class, and I went off to teach spinning. Well, so far, only one twin has had the monster bad stomach bug, and everyone but me seems to be over the cold. I am hoping passionately, crossing all my body parts, etc. that no one else gets sick. To give you an idea of how bad all this was? I did not even want to knit. Not at all. I sat on the couch and just gave in to the yuckiness of it all. However, my class went really well. It was small, but I helped three new handspinners learn to spin. They were fascinating people and despite the tail end of my cold, I enjoyed it immensely. Note: It was maybe -25F (-31C) that day, with the windchill, so maybe a sleigh would have worked better!? It's been genuinely chilly here the last few days. (-40 windchills) Plus, we've been fighting a cold virus in the family; it's slowly making the rounds. One or two of us are sick at a time, which means that I've had several quality days at home with somebody sitting on the couch, watching kids' programming on PBS and CBC... but that's not all bad. First, both twins suddenly made this huge connection... their Daddy (aka the Professor on this blog) is a scientist, and on an episode of Sid the Science Kid, they learned about how scientists use computers to do science and send emails reporting on their findings. Whew, that suddenly explained why Daddy uses his computer all the time! Pretty cool stuff to ponder when you are four and sick on the couch with a cold. 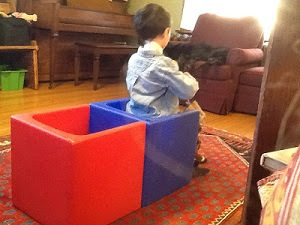 We experimented with an iPad later; we sent an email and watched it arrive, imagining it flying invisibly through the air. Wow. Magic. 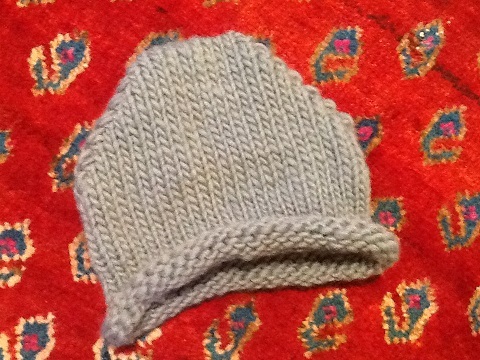 Second, I got to do a lot of productive knitting. When I might normally have gone out to buy a birthday present for a friend of theirs or rummaged among our special home gift box, instead I stayed home and made a hat. 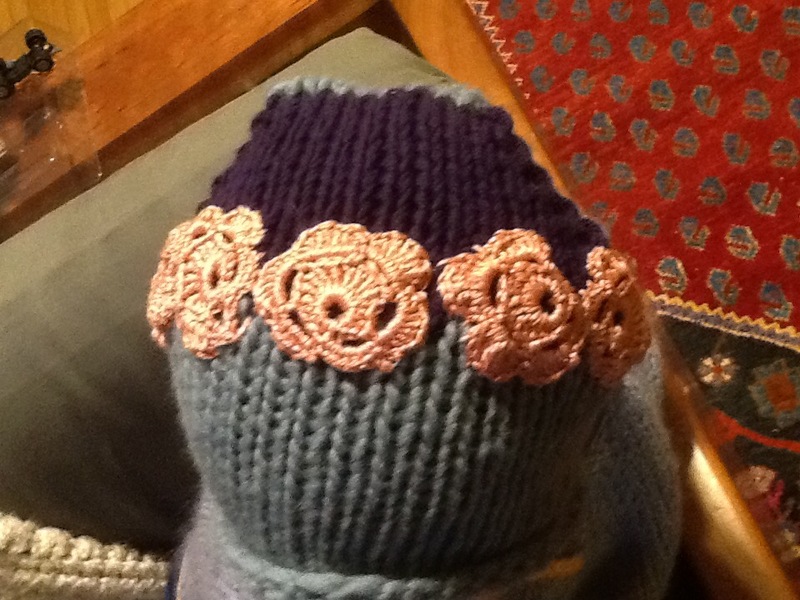 I used this pattern, but revised it to suit a girl who likes purple and flowers. 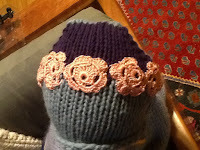 The crocheted flower rosettes were actually not made by me, either! Long ago, I got them in a stash exchange, a half finished project was included. This was some creative re-use! Here's the project page on Ravelry. The skein of Quince & Co. Puffin yarn was really lovely stuff to work with, and I thoroughly enjoyed knitting up a second hat to be donated to a newcomer to Canada who might need woollies this winter. Information on creating a liner for the hat are included in these Ravelry project notes , these big stitches will not keep out prairie winds on their own! Playing with this yarn made me realize that it would also work really well for Over, my new sweater pattern. (Alas, with the current Canadian dollar exchange rate, I'm probably not going to be able to swing that, but another good Lopi yarn substitute might be Briggs and Little Super here in Canada. and I included a little sale information. and get 20% off of any of my Rav patterns or my eBook until the end of January. Happy knitting! Happy winter! Now you can enjoy the sale too! Oh...and don't forget! Please remember to register if you'd like to learn to spin on Sunday, January 24th, here in Winnipeg. I can't wait to meet you and spin with you! Ditching online anonymity could actually make us better people"
but as you might guess, it didn't work. In fact, I am not sure if it was the Blogger app, or juggling twin 4 year olds in a new place, or what!? but I just got down to basics. I gave up on the complicated online stuff, and focused on the essentials. There were a lot of things to focus on: sunshine, sand, beaches, digging (our guys love to dig) and trying to keep them from killing themselves or others. In the process, in the first week, we visited Sarasota, saw 21 relatives from the Professor's family (yup. 21.) and in the second, well, that was my family, and there were only (wait here....) 11 of us, getting together to celebrate my parents' 50th wedding anniversary. Yet, on the second week, we drove across Florida to Cocoa Beach, took our first ever cruise (Disney cruise), and you know, there were over two thousand people on that, and that does not count the crew. We ended the vacation back where we started. Our direct flight to Winnipeg left from Orlando, and if you have ever been to Orlando during winter break, well, even if you do not go to Epcot or Disney? Even if you just try to drive to someplace for dinner? Crazy making. But? It was warm and sunny, there were endless amounts of sand, and the boys met a lot of relatives. We had some important celebrating to do. I think it would be fair to say that I am an introvert, and that I was absolutely peopled-out. We are very glad to be home, in "snow time" again, with our dogs. Yesterday, both twins cheerfully pulled on their snow suits and boots, and the Professor, our sons and dogs all went out to the front yard together to dig, move around about a foot of accumulated snow, and chase each other. Ahh. Home. 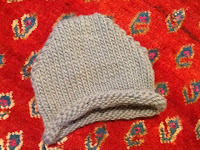 Here is a quick snapshot of twin sweater #2, knit on #5(3.75mm) needles. That's 2 ply handspun Shetland naturally brown yarn for the body of the sweater, and the collar is 2 ply, hand-dyed (by me) silk/merino handspun. This is the only shot I could find where he wasn't moving at the speed of light. The sweater already looks a bit worn= he likes it! I plied the yarn yesterday, in between loads of 'coming home' laundry. It's about 22 yards, for a friend who makes books. She will use it to sew exposed bindings, I think. It's shiny, skinny, and strong stuff--just a bit of gorgeous fluff can do with a spindle. I'm continuing to use that Patons Kroy sock yarn. I've always found it wears well, but am noticing that the most recent batch seems silkier than I remember...always good for little boy feet. 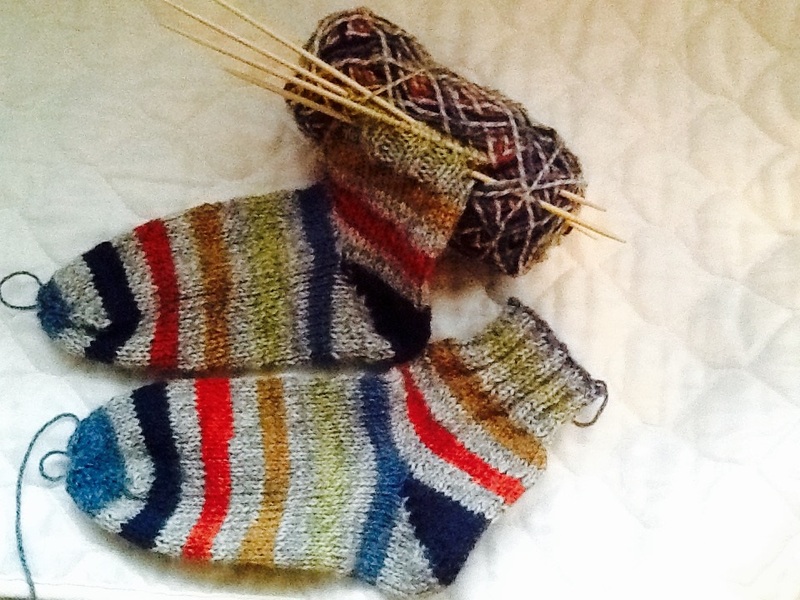 Their feet are growing like weeds so I need to get going on making more woolly socks! Last, but certainly not least....if you're interested in picking up a spindle and beginning to spin, I've got something for you! I'm teaching a Learn to Spin class on January 24th in Winnipeg. It's a Sunday afternoon event, hosted by the Norwood Naughty Knitters, and it's designed to enable new spinners to walk away spinning on a spindle by the end of class. You'll leave with a spindle, some wool, and a brand new skill! Please sign up soon to get your spot!